Due to the technical difficulties Steve is experiencing at the moment, I'll be flying solo with the blog for a short while. I hadn't listened to this album for a long time for whatever reason, and had forgotten just how incredible this album was for its time. 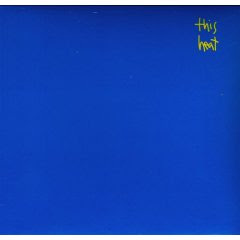 Originally released in 1978, This Heat created one of the more influential records to a number of other bands I listen to. Whether its the Shellac-ish chuggalug of the track "Horizontal Hold", the Liars-esque churning of the track "The Fall of Saigon", or the experimental noise which occupies about half of the record, their impact on more modern genres is apparent. i love this record! thanks for showing it to me. the rovo was great too. their new record condor is great. Thanks for this, man. A few weeks a go I heard a track off this at last.fm and ive been looking allover since.